A candlestick only gives you the Open, High, Low, Close. Spot the most aggressive side and act quicker with the DeltaPrint©. Realtime support and resistance indicator. Not based on lagging indicators, it will update realtime. 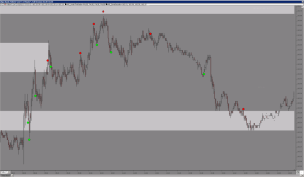 It uses volume and orderflow to determine levels based on statistics. See the activity since the last price extreme of the current bar was created. 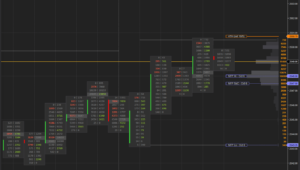 Monitor the moves off the high and low of the current bar to provide you with a very detailed view of shifting orderflow. 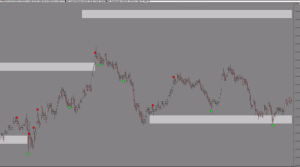 It helps day- and swing traders to quickly identify areas that often become significant support and resistance levels. 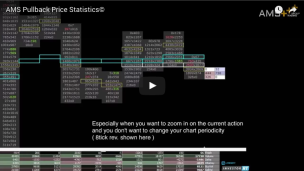 This algorithm provides high probability turning points and buy and sell signals in real-time. An extra benefit, that it is optimized for 4 products, each with their own tweaks and settings. ES, Crude Oil, EuroStoxx 50 and Euro-Bund futures. CloudLevels plots data that FT71 (FuturesTrader71) provides every day. You will always be up-to-date with the intra-day added/adjusted levels that are worth watching. You have also the possibility to use your own (remote) .csv files. Still unsure of do you have any questions? or schedule a free session.